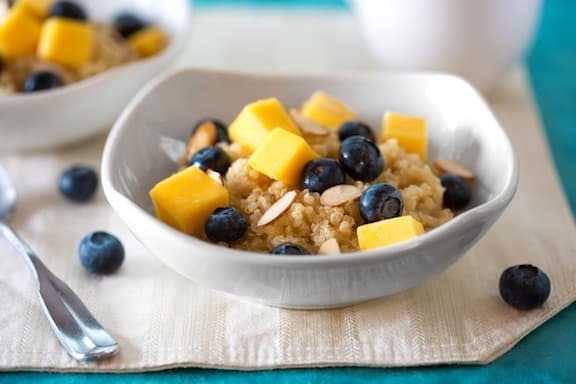 Start with cooked quinoa, then add a bit of sweetening, spice, fresh fruit, and nuts or seeds for a nourishing breakfast that will sustain you through the morning. If you make quinoa recipes regularly, you may have leftover, unseasoned quinoa in the fridge, which is ideal for this — less to do in the morning! Photos by Hannah Kaminsky. Warm the cooked quinoa in a small saucepan with a little nondairy milk (or, if cooking from the start, add the nondairy milk once the quinoa is done). When most of the nondairy milk has been absorbed, transfer to a bowl. Stir in sweetener and spice to taste. Top with fruit of your choice, followed by nuts and seeds of your choice. Serve at once. Note: You can use a touch of stevia liquid or powder instead; remember, very little goes a long way! Variation: Use other leftover cooked grain in place of substitute (brown rice, couscous, barley, etc.). Or use rolled grain flakes like spelt, kamut, steel-cut oats, or even quinoa flakes. Thanks for a truly delicious recipe! This was wonderful and my first time using quinoa. I will definately make this again, yummy! So glad you enjoyed, this, Emilie, and that it was a good intro to using quinoa. 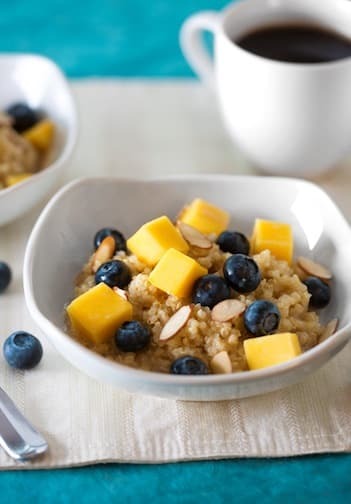 Quinoa really is such a gift — so versatile and nutritious!